The Newark School District’s RFP called for the replacement of the Harriet Tubman Elementary School which presented an architectural problem of two scales – that of the extended local community and relationship to the neighborhood in Newark that it will serve, and that of the small community that exists within the school itself – the children, teachers and staff. The new school on this site would further reinforce and invigorate the renewal that is currently occurring as a result of the surrounding residential construction activity. Part of the quality of the design must come from the importance that the building has as a contributor to the fabric of the neighborhood, particularly in this case being on a triangulated site that fronts a multi-street intersection. This intersection will undoubtedly become more significant with the existence of a new school that will occupy an entire block forming one of these corners. The new school has the responsibility to be recognizable and a source of pride in the area. At the same time, the nature of the elementary school warrants somewhat of a disassociation with the monumental impression of a civic structure, particularly in the interior spaces. Consideration must be given to the users and the impressions that the building will have on them. Today the opportunity exists to utilize interesting and colorful materials, more generous daylighting, and variety to the planning. Sound detailing, coordination and proper specification of materials will set the parameters for a good building. Programmatically, the school must have the ability to open many of its spaces to the community for use after hours and on special occasions. The gym, the auditorium and the cafeteria are particularly well suited for public programs, and the inclusion of a community health clinic add to the appeal. 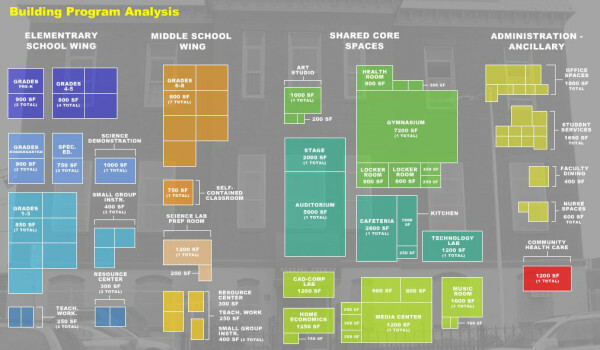 With this consideration, the functional layouts must take into account the ability to separate and secure sections of the school to permit activities between different populations. We have evaluated the existing site with regard to primary traffic and pedestrian patterns, major and minor intersections, significant existing structures and other features, and the orientation of the block to sunlight throughout the day. Coupled with the program issues described above, three diagrammatic schemes were developed. This scheme opens the outdoor spaces of the school, which contain playgrounds and a basketball court, to Holland Street, a street lined with small-scale row houses. The “community” spaces occupy opposite ends of the site – the auditorium forming the triangulated corner relating to the existing religious structure in scale, and the gym anchoring the opposite end at Gold Street, where parking and service entries are located. The school classroom and administrative functions link the two together, yet allow for a clear separation when required. The major entry point to the school is at the bend in Blum/South Tenth Streets. A new school garden area relates to the current garden across Blum Street. Places the major assembly spaces (gym, auditorium, cafeteria) and clinic within a distinct multi-level volume at the Gold Street end of the site, along with parking and service. Special classrooms and the medial center occupy the important corner at the acute angle. 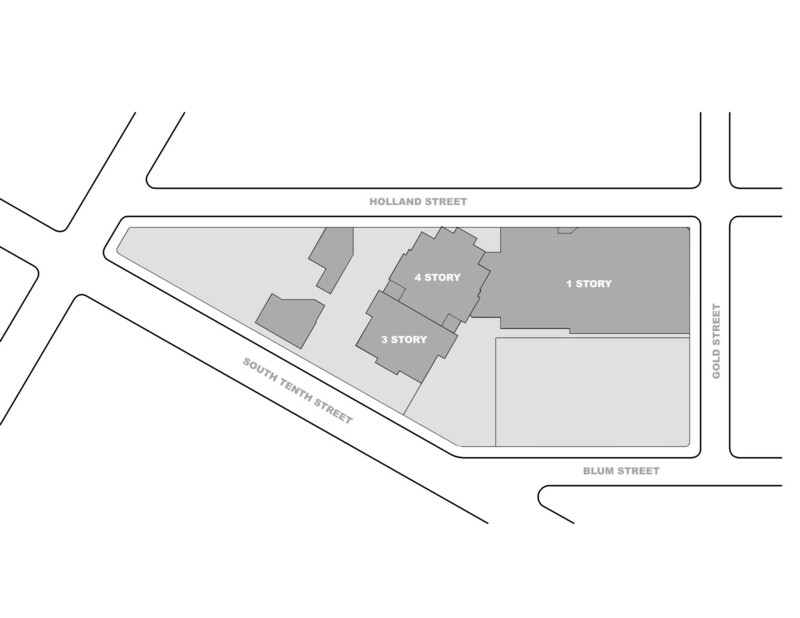 Again, the typical classrooms and administrative functions link the two (where the major entry is located), but in this scheme occur on the Holland Street side. Variety of scale and form is given to this street frontage to deal with the low profile house row. Nearly the entire length of the site along the Blum and South Tenth Street edge is given to outdoor spaces – the garden, basketball court and play areas. The major entry to the school is located at the dominant corner. From this point classrooms and administrative areas split and run along adjacent streets, ending in a block of assembly spaces. By occupying nearly the entire perimeter of the block a courtyard is formed allowing for placement of all exterior program elements in a controlled location. This scheme shows interior circulation ringing the courtyard along the two long sides, glazed to allow view to and from the courtyard.